Could the The Sinister Six movie still happen? According to Drew Goddard, who wrote the script and was on deck to direct, it's not impossible. And strangely, he may have a point. The movie came about as a result of Sony trying to ambitiously line up a bunch of Spider-Man spin-off movies in the wake of The Amazing Spider-Man 2. 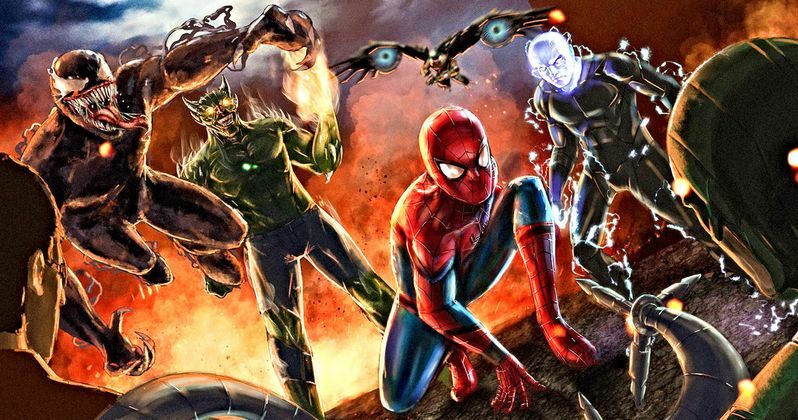 However, that didn't end up happening and the studio ultimately cut a deal with Marvel Studios to allow the webslinger to pal around with The Avengers in the Marvel Cinematic Universe. And with that, we assumed the Sinister Six spin-off was dead. But maybe not. Drew Goddard is currently making the rounds promoting his latest directorial effort, Bad Times at the El Royale. During a recent interview, the filmmaker was asked about his Sinister Six movie. While it doesn't appear that he's terribly optimistic about the possibility of doing this Marvel super villain team-up movie, Goddard does think that the project could still see the light of day. Here's what he had to say about it. "It was really fun [developing Sinister Six]. I wouldn't have done it had I not thought there was a real opportunity to do something different and exciting and just flat-out bananas. It was very much me and, a much more commercial version of, the Cabin [in the Woods] mentality. The punk rock mentality that led to Cabin is very much at the core of Sinister Six. That's a fun one. Who knows, it could see the light of day. It's funny, I've been through a lot of volatility at a lot of different studios. Between MGM and Sony and Fox. At a certain point, you start to realize, 'Oh, this is just a volatile business' and you try to stay afloat as the boat rocks back and forth." The Amazing Spider-Man 2 helped tee up the Sinister Six team a bit and would have been something of a backdoor into the proposed spin-off. Depending on how the script was written, Sony could make use of the idea, with a different cast, as part of their new universe of spin-off movies that kicked off recently with Venom. The idea was to have the team of bad guys operating in a movie without Spider-Man anyway, so why not? There's no reason it couldn't work, in theory, with some tweaks. For the time being, Drew Goddard is going to be busy (hopefully) making the X-Force movie as a follow-up to Deadpool 2. The Disney merger with Fox could end up getting in the way of that to some degree, but that's the plan at the present moment. So even if Sony decides to dust off this Sinister Six idea, it would either have to be several years in the future, or they would have to proceed without Goddard. But odds are, this is something that probably won't actually happen. Unless Marvel Studios decides to have Tom Holland's Spidey face off against the bad guy superteam in the future, which isn't totally out of the question either. This was originally reported by The Hollywood Reporter.